A perfect summer salad recipe! 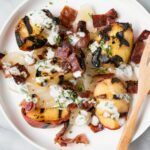 This Grilled Peach, Onion and Bacon Salad is made entirely on the grill and has a dreamy buttermilk herb dressing. The weather’s been fantastic and that gives me a perfect reason to have my husband barbecue. I have zero game on the grill, it’s one cooking piece that I’m lacking and am hoping to work on when we move later this summer. Don’t get me wrong, I still have to prep all the food and layout explicit instructions, but at least it’s not another pot to wash. 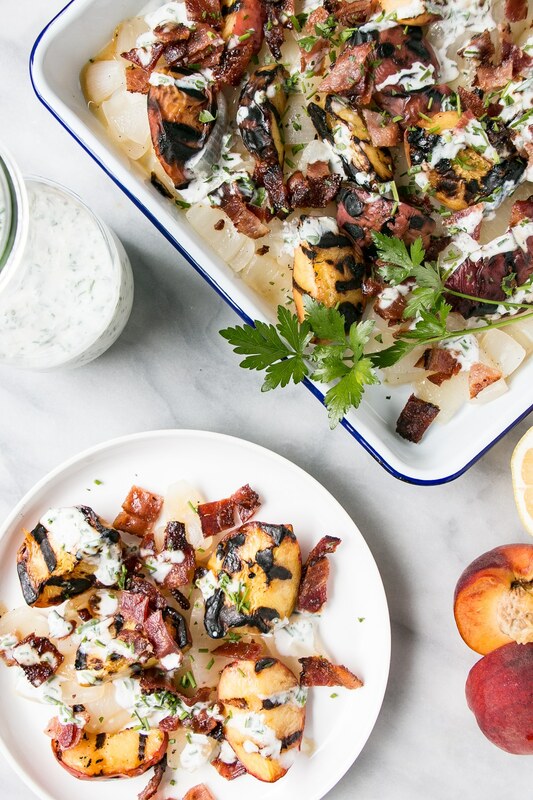 This salad was perfect for a warm summer’s dinner. 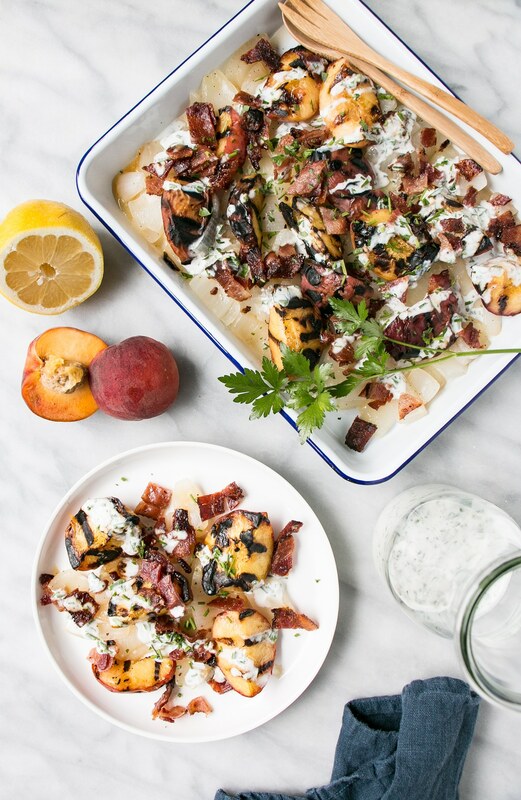 A true summer salad. 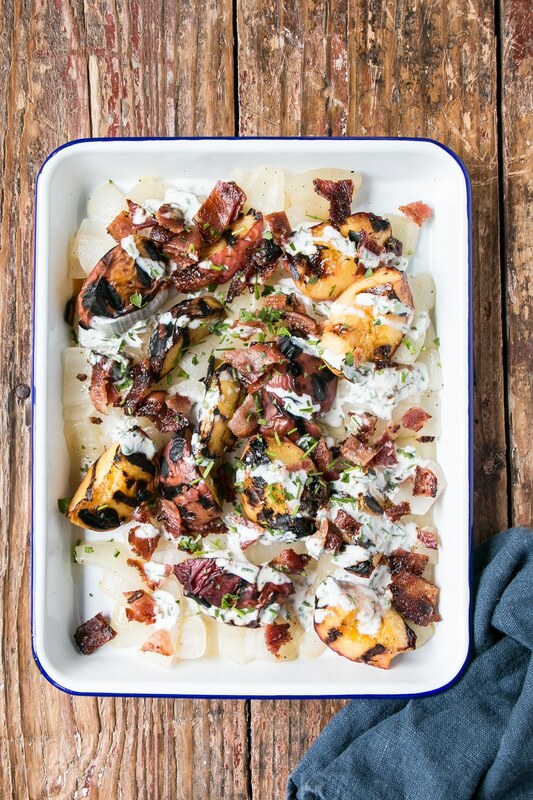 It has the juicy grilled fresh peaches and slightly charred rings of onion. I’m hoping to make it again during our family vacation into the BC Interior. Make sure the peaches are ripe otherwise they’re a pain to segment. I left mine in a paper bag for a few days to speed up the ripening process as the peaches aren’t fully ripe yet. My favourite of this dish was probably the bacon though. It has cayenne pepper and brown sugar sprinkled on it before baking and it results in this wonderful spicy and caramelized crispy bacon. So good. 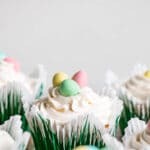 The recipe makes a lot so either plan to serve generously or for large group. It’s a full 4 servings as a main and about 8 servings as a side dish. Whisk all ingredients together. Season with additional salt and pepper after tasting (if necessary). Set aside. Preheat BBQ to medium, around 325-350° F and line a large baking sheet with foil. Arrange the bacon in a single layer and sprinkle with brown sugar and cayenne pepper. Place baking sheet on the grill and BBQ for 20-30 minutes, until bacon is caramelized and just starring to crisp (it will continue to crisp as it cools). 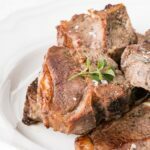 Let cool and cut into bite size pieces. Place onion pieces and olive oil in a foil pack, season lightly with salt and pepper (a pinch each). Grill over moderate heat for about 10 minutes, until soft and starting to brown. 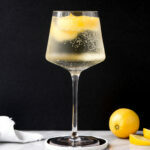 Turn the heat to high and add the peach slices. Grill for about 2 minutes. 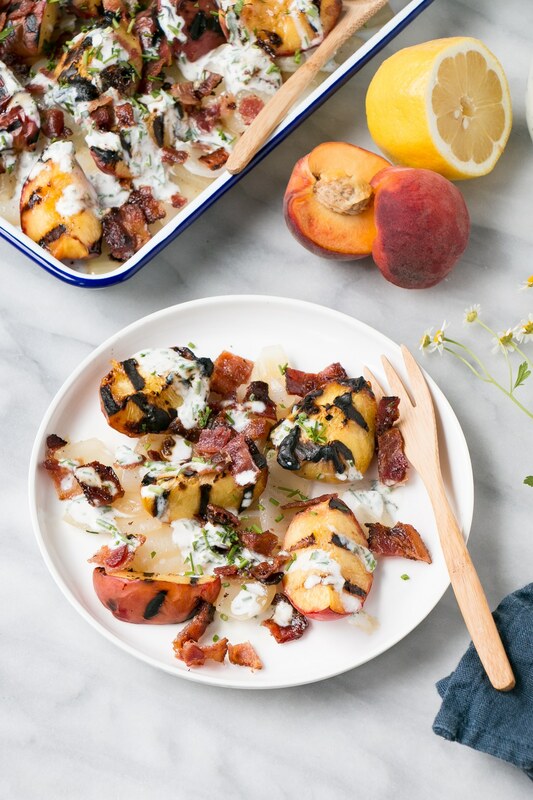 Transfer onions and peaches to a plate. Separate onions into rings. 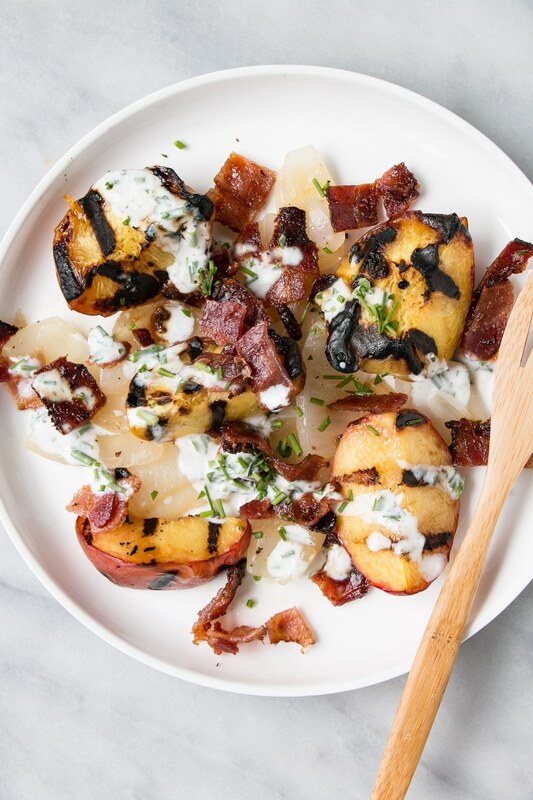 Plate bacon, peaches, and onion onto plates and drizzle with buttermilk dressing.